Like many of our readers, I have an unhealthy fascination with rotary and other non-reciprocating piston engines. 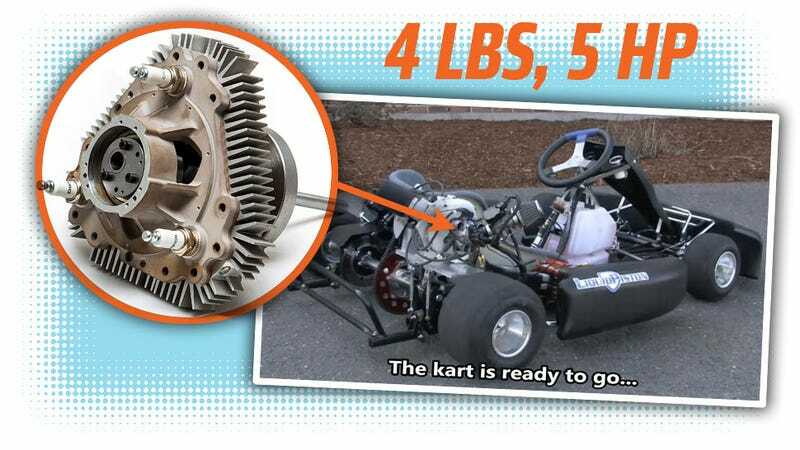 In fact, that very first sentence right there probably alienated most of our saner readers, but I don’t care, because a new type of rotary, non-reciprocating combustion engine was just tested on a kart for the first time, and it seems pretty fascinating. The engine is Liquid Piston’s X-Mini engine, which up until a couple of days ago had only been tested in a laboratory context. The X-Mini engine is a bit similar to a Wankel engine, but sort of reversed: where a wankel has a triangular-ish shaped rotor in a sort of siamesed-circle combustion chamber, the X-mini uses a siamesed-circlular rotor in a triangular-ish engine block. Liquid Piston claims the engine is about 20% more fuel-efficient than a conventional combustion engine, and has much less noise and vibration, as well as being significantly smaller and lighter. The company is targeting lawn equipment initially, but has much larger plans, with a focus on range extenders for electric vehicles. The X Mini is a gasoline-powered 70 cc engine with a 4-pound core that fits in a 6.6” x 6.2” x 5.4” box, making it 30% smaller and lighter than comparable four-stroke piston engines. The spark-ignited engine only has two moving parts and has shown high power density, producing 3.5 HP (indicated at 10,000 RPM). The engine weighs just four pounds and produces over 5 HP at up to 15,000 RPM. A four-pound engine that produces 5 HP is pretty impressive; to compare, a 5.5 HP conventional lawnmower engine weighs around 30 lbs. The engine architecture is inherently scalable from 1hp to 1000hp. They can scale the engine by increasing the size of the rotor (width / diameter) and also by stacking multiple rotors together (so each rotor balances the other, much like the Mazda rotary design). In a multi-rotor design, each rotor behalves like a 3-cylinder 4-stroke engine. LiquidPiston’s first ‘X’ engine prototype was larger, at 1.2L (up to 220HP), and operated on Diesel in true Compression Ignition mode. The 70cc X-mini is now relatively far advanced in its development, but the initial 1.2L X1 Alpha prototype demonstrates the breadth of the technology. However, LiquidPiston’s primary long-term goal is for the engine to serve as a range-extension for Electric Vehicles. Consider the auto-maker that can provide an EV that has 30 miles of electric range - sufficient to cover 90% of a user’s daily driving needs. Such a battery pack would be small, light, and cheaper. Our X4 engine (currently a concept) will provide 30kW of power on Diesel fuel, in a package that weighs just 30 pounds, and fits in a 10x8x8" box. If configured as a range extender for the EV, such an engine can be used to power a generator that would charge the EV batteries, extending the range to 300 miles that drivers are accustomed to - while also enabling the driver to refuel at any gas station, much like they do today (no planning through charging way points required). Not only is this a win-win combination for auto makers and drivers, but perhaps most interestingly - the X4 engine is envisioned to have better fuel economy than a heavy duty diesel truck; as such, charging the battery with Diesel will actually have a lower CO2 footprint, as compared to charging the EV on the U.S. power grid. It is sometimes forgotten that the US power grid actually burns coal and gas to supply a significant amount of energy, and the transmission / distribution network is not very efficient. Generating the power right at the point of consumption can change this. All very interesting. Of course, I’d love to know more about these from actual experience, so I’ve put in a request for a loaner engine that maybe we can build an experimental Jalopnik kart/neighborhood car/Crapmobile around. The request has been passed along, so we’ll see what happens. I could use it as a testbed for my manual CVT idea! This thing is so nice and small; maybe they need to make 0.5 HP versions that you’d clip to your phone to not worry about battery life anymore, and enjoy the benefits of a phone that never dies and also makes noise and exhaust.